If you don't have a friend locally that you can play with, you can play with an AI Player (Computer NPC). But with The Battle Tree, there is a new feature that can be used with the AI Players you can possibly team with. As you go through any battling mode apart of the Battle Tree, a player can spend 10 Battle Points to Scout the given trainer. By doing this, this will allow for them to join you as a potential partner in Multi Battle Mode. This can even be done with Special Trainers like Red and Cynthia, and other returning characters for older games. 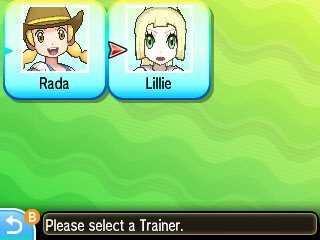 You begin with only one trainer to team with, Pokemon Breeder Rada; however, you can add Lillie to this list if you speak to her in Professor Kukui's Lab. And the Pokemon the trainer brings in Multi Battles will always be the first two in their Pokemon Parties when you battle them in other modes.